AMD has clarified that two of the four silicon die are 'dummy' blanks rather than disabled Ryzen chips. He found that AMD lied. There are four Zeppelin dies on ThreadRipper. There are only 2 dies and the package is electrically different from Naples/Epyc, it isn't a salvage part. I will write it up in a bit but the 'rumors' are BS and based on both ignorance and, well, not asking the source. Now der8hauer has demonstrated that there are four dies, despite Charlie insults. I am still awaiting to Charlie to detail the packages differences. Many other outlets reported the same story. Nobody should really care about all this as it is just not relevant. I'll will follow their advice. I don't care what you think, and nobody else does actually, as it's totally irrelevant. As of Charlie's answer, you may await forever as i suspect he is not going to answer you. The answer is obvious, and you would know it by yourself if you werent totally obsesed and ofuscated in proving a point that nobody cares. I'm afraid that he is actually speaking the truth and not insulting. It was obvious from the very beginning that TR is not failed EPYCs. If anybody wants more details PM me, I can give them, but I refuse to discuss details in the presence of an obvious troll that distorts reality to prove his point no matter what. There will be a 32 core ThreadRipper! Intel's entire pricing schemes are being devastated by AMD's innovation is the take away from all this. I say there is no 32-core ThreadRipper, because thermals limits of the socket and other stuff like quad-channel. And what "AMD's innovation" do you mean? Moar cores and MCM packages are older technologies not invented by AMD. Offering more performance for less money! Performance that was previously much more expensive! That is innovation! Offering more performance for less money is like the whole industry advances. IBM, Intel, AMD, Nvidia, Apple, Sun, ARM, Qualcomm,... all them offer new products with more performace for less money; otherwise people wouldn't upgrade. There is no "AMD's innovation" here. You are just being argumentative. AMD has the lead in price to performance. ■ IPC is not a linear function of number of transistors. Thus getting 10% higher IPC doesn't cost 10% more. ■ 512bit FMAC units and datapaths require much more transistors than 256bit or 128bit, and that extra space adds to the cost, but that extra cost is not counted when reviews only check performance serial x86 workloads or 128bit vector code, which don't use the 512bit. ■ Yields aren't linear. So dies with higher core counts cost much more than dies with lower core count. That is the reason why AMD uses a MCM approach instead a monolithic die. A pair of 8-core dies is cheaper than a single 16-core die. ■ I know that developing a process node that can hit 5GHz costs much more than developing a process node that can hit 4GHz. ■ I know that developing a process node with HD cell density of 0.0499μm² costs much more than developing a process node with 0.064μm² density. Summing all those factors, we find that the CPU that targets higher performance will cost much more and will have a lower performance/price ratio that the CPU that targets lower performance. And all that without even considering production volumes. Mainstream products fabricated in larger volumes are cheaper than enthusiast products fabricated in low volume, as follows from a simple application of economic laws of scale and serial fabrication. The nonlinear relation between price and performance also applies to opther industries. Developing a car can hit 400KM/h cost much much more than developing a car that only hits 200Km/h. So when comparing speed/price a Toyota Prius wins over a Ferrari F150. The Ferrari has worse performance/price ratio because the laws of physics aren't linear, not because Ferrari is an evil company and Toyota is "innovating". People would stop pretending that AMD leadership on performance/price is something special, or revolutionary or "innovative". It is not. It is just the result of a lower performance target technology. I can sure you that if AMD ported RyZen to Glofo 14HP node, added two extra cores per die, and updated to 512bit, the resulting chips wouldn't cost much much more and ruin the performance/price ratio. I can go to Walmart and buy a 65" 4k TV for $549.99 electronics in the rest of the consumer market has gotten cheaper! Not microprocessors, until this year thanks to AMD destroying Intel's money grab pricing schemes! Price is a function of supply and demand. And Intel is feeling the pain having to discount the 7900X on top of the 50% reduction in price of last years 10 core offering. Intel has managed to raise the cost of their chips even though production costs have continually dropped at each process node. They create and maintain a monopoly to keep prices high. They starve out their closest competition to keep prices high. Now magically because of competition they can drop their 10 core price to half what they asked for it last year! Intel has done the opposite of innovate with rebranding processors, and mainstreaming quad cores for 10 year. They have use strong arm bulling tactics to maintain a dominate position so they can over charge it's customers! Interesting you mention, so blatantly as well, that "Toyota is not being innovative" compared to Ferrari. Toyota is bigger (as a company) than Ferrari (as an individual brand and not under the FCA umbrella, but even then, they might be bigger anyway). I actually have to say it is absolutely the other way around. Ferrari is the company that doesn't innovate and sticks to "old formulas that work". Hell, they even don't like using Turbos in their engines and we all know they catch fire easily, whereas we all know Toyotas are going to outlive humanity and will be driven by the mutant cockroaches after humanity dies. In terms of "pure" innovation, Toyota has more under their belt than the whole of FCA's divisions combined. Just take a look at the first companies to use VVT and the first companies to use Direct Injection, Dual Headcams, 16 valves, etc.. You will find Toyota being the first in all of them, pretty much. Ironically enough, I do agree that in your analogy, Intel fits Ferrari better. They sell you the illusion of buying a great car, great performance, but never telling you about running costs and how often it will break on you, or even burn to the ground. Toyota will sell you, pretty much, anything you want in pretty much any price bracket and you will be counting on their innovations day in and day out. Ferrari will give you a great illusion of going faster, great track numbers and a lot epeen, but at the end of the day, if you buy a Toyota LFA or even a Toyobaru, you will have the same fun, or even more. My analogy was an attempt to explain that the nonlinear relationship between price and performance is not exclusive to chips, but applyes to other engineering areas, including cars. My point has been completely ignored. 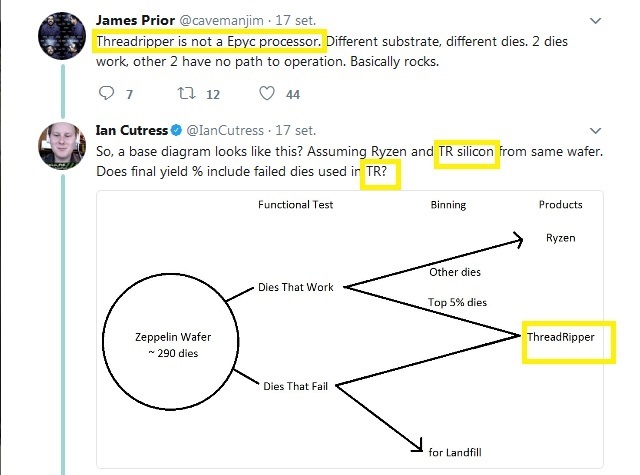 As stated above Ian is talking about RyZen Pro, not about ThreadRipper. And cut down the insults and attacks! As usual you are starting to rewrite history and invent words that AMD never said. Actually you are unable to link to any official statements from AMD on the issue, because there are none. Update: AMD has clarified that two of the four silicon die are 'dummy' blanks rather than disabled Ryzen chips. They are included for structural stability. The two die that are enabled sit diagonally from each other to aid in cooling. and der8auer found that there are four RyZen dies on ThreadRipper. First, it is not half the price. Sorry, but AMD is not at center of the universe, Not everything spins around AMD. The distorting reality part has been demonstrated, please stare carefully at the highlighted parts and tell us what you see. The twiter link given by Yuka is about RyZen Pro, not about ThreadRipper. Mounting dies to a substrate is like any other manufacturing process; there can be defects. It's possible that the Threadripper processors are simply EPYC processors with die that weren't successfully mated to the substrate. The image i posted is a screenshot of yuka tweet. I really wonder if you are selectively blind or just slow-witted. Different substrate = different PCB = electrically diferent -> what I and others have been saying from the very beginning. Your theory has been debunked. Move on. This last link is the link given by Yuka in his above post. This last link is a tweet about RyZen Pro. Anyone can click on both links and check are the same. One can also check both links have the same identifier: 909627789669781504. If you want to discuss a different tweet, you would have provided the link to what you want to discuss, instead posting images to different tweets and then insulting others, when they mention that your images don't correspond to the link given by Yuka. AMD responded that two of the die on shipping Threadripper models are not the same as those Der8auer found in the engineering sample - the additional two die are "dummy" die that the company uses to provide structural stability for the package. These additional die prevent the IHS (Integrated Heat Spreader) from caving in when you tighten down the heatsink. We followed up with AMD and inquired if the die were functional. AMD responded that two of the die are in fact non-functional "dummy" die that aren't connected electrically to the substrate. This seems to be dissembling on AMD's part. Reviewers have typically assumed (as did Anandtech) that the "dummies" were mere silicon blanks, not fabricated Zeppelin dies. Mounting dies to a substrate is like any other manufacturing process; there can be defects. It's possible that the Threadripper processors are simply EPYC processors with die that weren't successfully mated to the substrate. Conversely, it's also possible that AMD is using defective die for the fillers, but in either case, it's doubtful that the company is wasting functioning silicon. In fact I find the former explanation, that Threadripper parts are simply defective EPYC processors, far more likely. The reason is that even using defective Zeppelins for spacers is very inefficient from a manufacturing standpoint. The dies have to be mounted in some fashion as the functional Zeppelins are, and then they are soldered to the heat spreader as shown in der8auer's video. That's a lot of work, especially the soldering to the spreader, for dies that are non-functional and won't generate any heat. Probably a simpler spacer scheme could have been devised, such as machining the spacer into the underside of the heat spreader. This was in fact, the explanation I proffered on July 28, which apparently was so controversial. But the fan reaction to this probably explains AMD's dissembling about it. The fans don't like the idea that they're being sold EPYC rejects. They really shouldn't be upset. Threadripper is a perfectly reasonable way to salvage value from defective EPYC parts. I bolded the relevant part. No, but Intel is definitely the center of your universe, which operates separately from reality! Intel's money grab price schemes are a joke, and you fail to grasp that through sheer ignorance! Anyone with basic math skills can see that if you subtract the material required to create an object and all other cost remain the same it's cheaper to produce, which is the reality of electronics. You are just talking nonsense! As per usual! Paul Alcorn was wrong, Mark Hibben was wrong, you were wrong and still are wrong despite that it has been explained to you in detail. The possibility that ThreadRippers are failed EPYC is null, and always has been. Despite AMD's statement regarding its "dummy dice," some folks took der8auer's early delidding efforts as evidence that Threadrippers were merely AMD Epyc CPUs by another name. No one claims that ThreadRipper are EPYC CPUs with another name. What is being stated is that ThreadRipper are failed EPYCs. As Prior says, the two non-functional dice in a Threadripper processor are "basically rocks" with "no path to operation." That's to say that even if they were working processors, there are no connections to them in the Threadripper package. That also means the extra dice in the Threadrippers shipping today can never be enabled through some kind of BIOS hack, dashing the hopes of some optimists who thought they could turn them on somehow. In fact I find the former explanation, that Threadripper parts are simply defective EPYC processors, far more likely. My complaint is not about reviews whose tone shows an evident bias towards a given brand, where when AMD wins by a huge margin such as 30%, this is dismissed with Intel gives superior single thread performance or a similar claim, but when Intel wins by a margin of 30%, the tone changes to something like,"Why is no one is paying attention to Y-cruncher." Everyone uses it every day!!!!! 1) Testing quad-channel Intel chips vs. dual channel AMD chips is not bias, if the AMD platform has only dual-channel support, because it is the way platforms are designed. Testing quad-channel ThreadRipper chips vs. dual channel RyZen chips is not bias, because TR4 has four-channels whereas AM4 has only two channels. Bias would be to take an EPYC platform and disable half the channels and test only quad-channel when comparing with a quad-channel Broadwell Xeon. But no one is doing that. Intel is not doing that. On the other hand AMD has disabled channels on Intel hardware during biased comparison demos. AMD uses all the eight channels in EPYC during demos vs quad-channel Broadwell Xeon. The same AMD disabled quad-channel on Broadwell-E on demos RyZen vs of Broadwell-E. The bias on on AMD side. 2) Example of incompatible memory on AMD chips used in reviews? 3) Example of testing with workloads that have a bug favoring Intel? 4) No review has made tests consisting only on y-cruncher and AVX512. The reviews include a broad collection of workloads: compiling, games, rendering, encoding, memory operations, scientific workloads... On the other hand we have some reviews of AMD ThreadRipper that consists essentially on encoding, rendering, rendering, rendering, and rendering. 5) Reviews have tested chips at different resolutions. They have tested at 1080p or 720p, the so-called "CPU tests", to know the true potential of the CPUs, and then tested at other resolutions such as 1440p or 4K. Moreover, testing only at 1080p gives an idea of mainstream gaming (most people play games at that resolution, 4K gaming is a niche) and gives an idea of future gaming, when upgrading to a better GPU eliminates the bottleneck. Testing only at 4K doesn't provide that information. AMD on the other hand only demoed Zen at 4K, and 'recommended' reviews to tests only under GPU-bottleneck settings. The bias is on the AMD side again. 6) Who has tested memory-bound workloads with memory subsystem crippled on AMD side? 7) What compiler/flags combinations that reduce AMD chips performance by 40--60%? 8) Who has tested an engineering sample of RyZen or ThreadRipper instead retails chips, and label the chips on graphs as if were retail chips? 9) Who has tested overclocked Intel chips vs stock AMD chips, and label chips on the graphs as if were both stock? 10) Who has tested custom workload that favor Intel, instead existent official workloads? 11) Who has tested RyZen with beta BIOS, and don't retest latter with final BIOS? That's how you are supposed to test CPU performance: By putting the majority of work on the CPU, not the GPU. Besides, 95% of the planet still games on 1080p or lower; higher resolution displays are in the decided minority. If you prefer, we can test at 16k resolutions, and show that Ryzen performs about the same as a Pentium 4. But that wouldn't prove anything except that GPUs are holding back performance. The packages are physically different, anyone saying that a Threadripper is a failed Epyc is a rank idiot. If I need to explain this in more detail, consider yourself in the rank idiot category. James Prior confirmed the part in bold when he says "Different substrate"
your insistence and stubbornness is confirming the rest. 1080p, 720p, and at 60HZ! And with video cards under $500! So, at that point there is no advantage for Intel in gaming. It makes the test irrelevant for your "95%" of consumers, and becomes a puff piece in favor of Intel. I prefer that reviews state the truth, the whole truth, and nothing but the truth. Testing and benchmarks should show how it relates to the different consumer demographics. Mainstream gaming is done at 1080p, 720p, and at 60HZ! And with video cards under $500! So, at that point there is no advantage for Intel in gaming. It makes the test irrelevant for your "95%" of consumers, and becomes a puff piece in favor of Intel. I prefer that reviews state the truth, the whole truth, and nothing but the truth. Testing and benchmarks should show how it relates to the different consumer demographics. I have to side with gamerk there. If you're testing games, you want to see them in all possible resolutions and aspects possible. Particularly, it is true that, in 99% of the games you test, when you lower the resolution you free up the GPU bottleneck, so the CPU can process more stuff. Being "realistic" or not, is of no concern. The silver lining for this particular way of testing is around CPU instructions. I haven't seen any reviews that target specific binaries that some games provide to use different instruction paths. This is to bring a point that jdwii pointed out a while ago with Dolphin. I think it's an interesting thing to add some "weird" tests that might not be "popular" or "massive" (ironically they only test AAA games, when DOTA 2, for example, doesn't rely on GPU but CPU mostly), but can indicate special weaknesses or strengths for different game versions. I have to side with gamerk there. If you're testing games, you want to see them in all possible resolutions and aspects possible. gamerk isn't talking about all possible resolutions or aspects possible. Just low resolution. Particularly, it is true that, in 99% of the games you test, when you lower the resolution you free up the GPU bottleneck, so the CPU can process more stuff. Being "realistic" or not, is of no concern. No concern to who? It is relevant and an absolute concern of everyone who wants to purchase a computer, and associated hardware to game. For what purpose is this testing done? To test and compare video cards and processors. Why do it? So consumers know what to buy to fill their needs/wants. Using 1 narrow view or data range is highly deceptive for people who do not realize that their $200 graphics card will offer no more benefit using Intel or Ryzen at 60HZ. Cost: Saving that extra $150 by purchasing a 1600 over a i7 7700k. I think it's an interesting thing to add some "weird" tests that might not be "popular" or "massive" (ironically they only test AAA games, when DOTA 2, for example, doesn't rely on GPU but CPU mostly), but can indicate special weaknesses or strengths for different game versions. More data is always better than less data, but as I said data needs to be arranged to show the consumer demographics for which it represents. Otherwise it's just using data to leading the herd off a cliff. Look at it this way: Your running at 4k with a 1080Ti. At this res, even the 1080Ti is probably a bottleneck. So seeing no difference between two different CPUs, you purchase the cheaper of the two as they offer equivalent performance. Fast forward two years. NVIDIA releases the 3080Ti, which you purchase to upgrade your 1080Ti. You run the same program at the same resolution. You find your FPS didn't go up. Why? Because you've now exposed a CPU bottleneck that was previously not noticed due to the test settings/resolution. And with a more powerful GPU, you now notice your choice of CPU ended up preventing future upgrades to other components from having their maximum effect. Testing CPU performance while a GPU bottleneck exists accomplishes nothing except compressing the results and giving the appearance that a significantly weaker CPU performs the same as a higher performing one. I think CPU performance is close enough now that the GPU will determine future performance. Now, new technology can absolute change this. I give the Vega 64 with Rzyen CPU at 1440p as an example. edit: single threaded performance has already showed diminishing returns. But there is still a big enough in terms of performance (IPC+Speed) to be quantifiable in a significant way (whether or not is important to each, is another ball game). These differences, like gamerk points out, get more noticeable in the long run. There's also an important thing to distinguish: you test the CPU for metrics or for a target audience? Indeed more data is never harmful and it doesn't necessarily need to have meaning for everyone. The meaning is the subjective part each one can decide on its own, right?